During the break between the middle school graduation ceremony and high school entrance ceremony, my uncle invited me to work with him and Aiko together at the hospital he is a director of. (Mum says it's good to know them better) Because I am his blood relative and with my knowledge on chemistry and biology, he just employed me to a position that would normally require a degree. That typically means that my colleagues are at least 7 years older than me. Of course, I would work part time. The white lab coat he gave me as part of the work attire made me look like a grown-up, but then again, considering my age, I might not grow larger compared to how small I was just 5 years ago. It's like the couch at home: I remember only occupying about one-third of the space when lying down, but now, not only my body occupies the whole couch, my legs are sticking out! I have grown so much that I find it hard that I came from inside my mother, whom I'm now slightly larger than. The oldest among my siblings will be entering the 6th year of primary school in the coming year, and the 2nd youngest is entering the 2nd year. The 3rd oldest is entering 4th year. Come to think of it, I notice that there is a 2-year gap between their ages, but 4-years between me and the 2nd oldest, and the 2nd youngest with the youngest. The genders of my siblings seem to alternate between each child, like my parents selected it for them, including mine. I have to keep intervening should they fight among themselves. Due to my height and age difference with them, they treat me the same way as they would with my parents, though they do sometimes drive me crazy partly due to the hyper-active nature of people of their age. Come to think of it, the youngest would probably have just entered primary school around when I enter college, as the age difference between me and her is 12 years! I looked through the student handbook. In it are the lyrics of the school song, the usual rules and regulation, some graphics and photos, address, map and directions to get there, and the rest of the books are just blank lines for taking in notes occupying more than half of the total pages, like the air in a bag of potato chips. Speaking of uniforms, I have ordered different sets for winter, summer, and physical education lessons at a uniform specialist in town and will collect them when it's ready. The rules allow wearing between a sweater or none for summer, overcoat or any warm clothing during cold winter, wearing the tie or bow are optional in the summer. Since it makes uniforms for many schools and business organizations, The stock at the store runs out quickly around this time of the year due to limited stock with high demand and had to place an order to get more priority when they restock from the factory somewhere. For Aiko, however, she could just buy it directly from the school. I went to the speciality shop to collect my uniform. They had called me this morning to say that it's ready to be collected. As I said, it's expensive, but uncle has helped me to pay the cost when ordering. Before I started working not too long ago, my dad was the sole breadwinner and works long hours just to earn enough to cover monthly expenses. The store is just opposite the street where I had karaoke with my middle school classmates sometime after taking the entrance tests. There are a lot of clothing shops to choose from there, some of which were where I had bought some of my clothes. Anyway, I approached the lady at the counter, mentioned my full name, and gave her the order receipt. She then headed towards the storeroom with my receipt to look for it. While waiting, I notice how relatively empty the store is with hardly anyone around. Seeing that there are various uniform accessories and stuff on display, I would guess that they had received plenty of the stock. 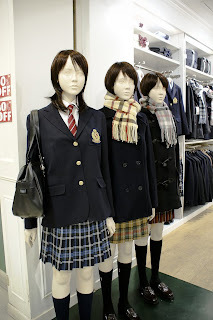 Besides, there are many days left before high school starts, almost everyone ordered it on the day of the results, and that the school allows wearing their middle school uniform on the first few days. When I first came in here, I thought those dummies at a corner of the store are real people, until I noticed that the skin colour is unusually bright and their eye pupil are unusually white too. If they had painted those in the right color, I would have though that they were real people! The store attendant came out of the storeroom with what seemed to be a navy blue blazer, a red bow, a skirt that is slightly darker than the blazer, a white blouse, a set for physical education lessons, and placed those in a plastic bag in front of me. She then headed back in there to take more. Are there more? Just how many did I order? In any case, she manages to find everything that I had ordered. I tried carrying them by myself, but found them to be heavier than what I thought it was. I think it's the blazer and the skirt forming that is forming the majority of the weight. Good thing I'm not a guy, because the pants contain more cloth than the skirt as the skirt is just up to above knee level and is just a round thing while the pants reaches up to the ankle and like wrap around the legs from below the torso. Their shirt and blazer are larger too, which means that the overall cost for the uniform sets for males are pricier than that for females of the same school. As I walked out, I started to wonder how to bring everything home by myself. Should I leave some behind and collect those latter? But, I don't want to pay more or waste time just for that extra trip. I could ask for help from people on the streets, but, except for a businessman holding a large envelope that is walking towards me, there isn't anyone else around. Wait, there's something familiar about that man there... It's dad! He spotted me having trouble carrying the bags and offered to help me to carry them. (Well, what kind of dad would he be if he spots his daughter having trouble and not do anything about it?) My dad says that he was visiting a business client around here and is on the way back to the workplace. I never seen him in an office attire before, let alone see him regularly at home. Somehow, I could sense disappointment of him not being able to get a job instead of what he had just told me earlier, judging from his tone of voice. He commented that I somewhat look more like him, now that I am almost grown up. He said that he was childhood friends with my mother and had me formed less than a year after graduating from high school, but that, sadly, means that my mother did not enter university. This largely explains why the age gap between me and my parents are narrower than most of my friends and the large age gap with my younger siblings. On those words, however, triggered me to see my mother in casual clothes being proposed in a park with cargo ships visible in the background from the viewer's point of view. The voice that came from my point of view was that of my father. What is this I'm seeing? Am I reading his mind or did it trigger a hidden part of my brain containing faint traces of my parent's memories? I also don't even know why I am smart or wanting to attract guys. The scenery changed with my father and uncle in view at a hospital room and sound of a machine being switched off. The voice that came from my point of view was that of my mother saying that she feels all right. It seemed that something had just happened earlier as uncle was at a strange machine. They were discussing on what they should name the baby mum is pregnant with and somehow knows the gender of the developing child accurately and that my uncle's "experiment" was successful. My view went downwards to reveal a large tummy with a hand on it. They had some suggestions, but soon decided on the name Kotomi (Isn't that my name?) and everyone agreed. 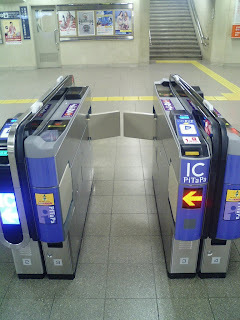 The train that heads towards our stop would be arriving in four minutes, according to the information display at the station train platforms. Along the way home, dad kept looking at me and my uniform like there's something wrong and muttered to himself that he should not have agreed with his brother-in-law on something that happened during the months leading to me being born and because of that event, and related ones later on, he does not want to head home early to see any three of his "mutated" children. What is he talking about? And what does he mean "mutated"? Judging by the way he looked at me, I could be one of them, but me and all of my siblings look normal. Kind of creepy when I think about it. I tried to ask what he meant, but seem to keep changing the subject. Once I got home, everyone wanted me to try out my new uniform. I am kind of annoyed with this, but since I am the first child in the family to enter high school, and that my oldest younger brother would only be entering middle school next year, I don't really have a choice. I tried it on: I look good in this, but my hairstyle needs to be changed. I'll try some styles out and reveal it to everyone only on the first day. Imagine the shock: people that know me would find it hard to believe that it's me, new people I meet would like me on first sight but won't recognize me when they see a photo of me with the earlier hairstyle. If they ever get to see it.